Urbanity Dance in the company's new space. Photo by Eli Akerstein. Space to dance in, freely and fully – finding it, and holding on to it, is a never-ending dance-world challenge. Sometimes (seeming) miracles happen, and dance entities – companies, schools and organizations – get wonderful new spaces that are theirs to keep. Urbanity Dance of Boston, MA, both a professional company and a school (in studio and in the local community), is expanding into a beautiful new dance space at 725 Harrison Street, Boston, MA. Urbanity dancers in the company’s new space. Photo by Eli Akerstein. Urbanitydance.org has more information on the organization’s mission and work. The 11-member company performs an annual revue and other projects, offering an athletic and unique movement style. Company members teach for Urbanity, along with various other teachers, in studio and around town. Even with this new space, the organization will keep operations running at its current location in the South End. As such, it signals growth rather just a location move for the company. 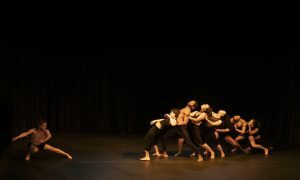 Dance Informa spoke with Betsi Graves, Urbanity Dance artistic director, about the expansion and what it might bring to the company. A main thing that the new space will allow is more adult classes in increased dance styles, Graves explains. Betsi Graves. Photo by Eli Akerstein. Classes on deck (or in mind) to be added include Salsa and Brazilian Zouk. Graves would also love to find a home for the beginner hip hop crew that would be based in the new space. This crew would offer performance opportunities for adults who may not all have extensive dance experience. Graves mentions the difficulty of continuing to perform into adulthood, if one is not at a professional level. Even if one has been dancing for years and is generally quite technically capable, if he or she isn’t contracted in a professional company, then performing most often has to end. “It’s the only art form wherein you have to ‘put away your paint brushes’, so to speak, in your 20s,” says Graves with a touch of sadness. Apart from such performance opportunities, the new site will offer a formalized office space for Urbanity staff, as they currently have no such space (and instead work on laptops at home, local cafes and the like). A third offering is space for fundraisers and other such events – for Urbanity as well as other organizations (as in-kind contributions or rentals). Graves says that the space might eventually be convertible to a suitable informal performance venue, but adaptations to the space are necessary first. The building is located in a neighborhood with families, and late night noise is a concern. “We definitely want to maintain good relationship with the neighbors,” Graves asserts. Urbanity Dance. Photo by Eli Akerstein. Speaking of being good neighbors, Graves hopes to involve the local community in future performances and movement projects, to offer local community members chances to “dig in” to the work of dance and dance-making. Graves wants to see this set of offerings include informal, inclusive events such as informal showings and conversations about dance. The dance world can always use space for creation, collaboration and feeling at home. At the same time, in many ways, so can so many out there in today’s world. All signs point to that Urbanity will intelligently utilize its new site for itself as an organization, but also for so many more in its locality. For more information on Urbanity Dance, including a class schedule, visit www.urbanitydance.org.